I agree with every word you say. I think completely AU scenarios are just fine but some fanfic conversions are blatant rip-offs. And it’s not just self-published writers who do this, supposed professional lesfic publishers do it too. Ylva Publishing released The Return by Ana Matics and when I read that, poorly written and edited, book I was stunned that it was so like the storyline of Once Upon A Time. Even more stunned to discover that Ana Matics is actually Ellen Simpson, who is a writer for the series Carmilla. I can’t imagine that Ellen Simpson would look too kindly on any authors who profiteered from using the Carmilla characters in their own books. If anyone at ABC took a glance at The Return I think Ylva Publishing would find it hard to fight the inevitable lawsuit. It’s a shame that some people are plagiarizing like this because it will only end up hurting all of us who enjoy reading fan fiction. Because when those lawsuits come, and they will, it will destroy a lot of fan communities. I think it’s a problem with several publishing houses, but I agree iwth your points. I also share your worry about what could happen with the fan communities if this all eventually backlashed. These are all ‘small potatoes’ in the scheme of things, but if anything got big enough for them to take note it could be a difficult situation for all. I promise if I had known that Xena fanfiction existed, I would definitely not have made the main character in my thriller series tall and dark with a shorter blonde wife. I cringe every time someone says I write “uber” anything. I can’t be writing Xena fanfic, because I’m not a fan, have never seen an episode, and think my character deserves a better actress. (Before the Xenites attack me, let me say I respect their loyalty to Lucy, but when I picture Rainey Bell, she’s more a mix of Angelina Jolie and Mariska Hargitay. As dramatic actresses go, I think my pair has a bit more chops.) I find it offensive that people think for one minute I would claim to have created characters based on someone else’s ideas. I’ve never understood how people continue to sell books that proclaim on the cover that the material has roots in someone else’s imagination. 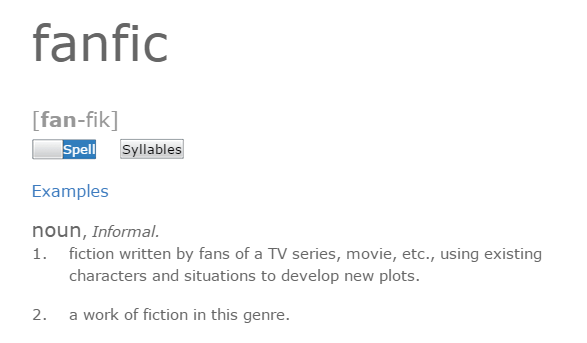 I believe fan fiction to be a great writing tool. I believe creating one’s own characters to be much more rewarding. I believe that selling someone else’s ideas is wrong on so many levels. Thank you for your post. The dark/blonde pairing has been around for much longer than Xena. What’s really being discussed is the blatant co-opting of characters from television shows/books. If something is only a basic physical similarity, it’s not really what this post is about. Characters who may only vaguely resemble characters depicted in other media aren’t really the problem as described in the post. I love fanfic. I’m a reader, writer, and supporter of it. With so many shows queer baiting, but never actually following through on a lesbian or gay storyline it’s wonderful to come across stories written by the fans where dreams do come true. 🙂 It’s an homage. Not a rip-off. Now, as you say in the article, if someone knowingly writes and publishes fanfic as a novel or novella for profit that is wrong. But as R.E Bradshaw (BTW I love the Rainey series) stated above, some people are claiming everything is based on fanfic just because the leads are described a certain way. There are lots of relationships in the world featuring brunettes and blondes. Seriously, there aren’t that many colors to choose from. Even if a novel isn’t based on a TV show or movie I confess that as I read them I find myself wondering which actor or actress would portray them in a movie. I’m building my own fanfic world in my head. Is that a crime? If I have a certain character or characters in my mind as I write does that make me guilty of plagiarism? I don’t allow my characters to be carbon copies of the characters on TV or in movies. I draw from my own experiences and create what I hope are new and interesting players when I write for anthologies and also the novel I’m working on. Where is the line drawn? Interesting topic. I have come to realize that I missed the boat as an author by not starting in fan fiction. I tried some but the copyright infringement made me uncomfortable, so it remains on my hard drive. But there is a fine line for publishers to tread. Who wouldn’t want a built-in audience (aka brand) for a writer. Publishers are in it to make money, and if someone like EL James comes with millions of readers, no matter how crappy her writing, then they’ll go for it. But to make no pretense of changing the details and coming up with something original, if “inspired” by something that exists, is a line I’m not willing to cross as a reader or writer. As a writer, I consciously shy away from having a character be tall and dark with a shorter, blonde counterpart. That’s annoying to be restricted. I feel for RE Bradshaw. Making money off someone else’s work is wrong. JK Rowling is famously in favor of fan fiction for her characters, but draws the line at making money off it. As I understand it, the resurgence of lesbian fiction since 2000 is largely due to Xena fan fiction (I’ve been shocked to hear young lesbians say lesbian fiction began with Xena!). Radclyffe being a prime example. It might also be why lesbian fiction languishes. But perhaps that’s a topic for another day?